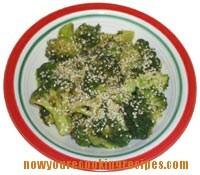 An easy Oriental style sauce makes broccoli special. Combine all remaining ingredients, except sesame seeds, in a small bowl. Microwave on high, stirring occasionally, until thickened. Pour sauce over broccoli and mix to combine. Sprinkle sesame seeds over top, if desired.